Unlike in the European Championship, Soviet and Russian soccer teams have always flattered to deceive at the World Cup, with fourth spot in 1966 representing the nation’s best finish. RBTH looks at some of the other highlights and records set by teams of the past on soccer’s greatest stage. The greatest achievement of the Soviet and Russian national teams at the World Cup was fourth place at the 1966 tournament in England. However, Soviet and Russian footballers have managed to set a number of records and hold some other dubious distinctions that have been preserved in the history of international soccer. Until 1969, referees could only send players off. An intermediate penalty did not exist. At the 1970 World Cup in Mexico, referees had yellow and red cards in their pocket for the first time. The USSR national team’s Yevgeny Lovchev received the first warning in the history of the World Cup. The referee who gave the card, Kurt Chensher, a German, also went down in history. Very few people now remember, but before the 1970 World Cup, substitutions did not exist. The starters had to play the whole 90 minutes and, if necessary, extra time. In 1970, FIFA decided to do the players a favor. The first player subbed out in the history of the World Cup was the USSR’s Viktor Serebryannikov. 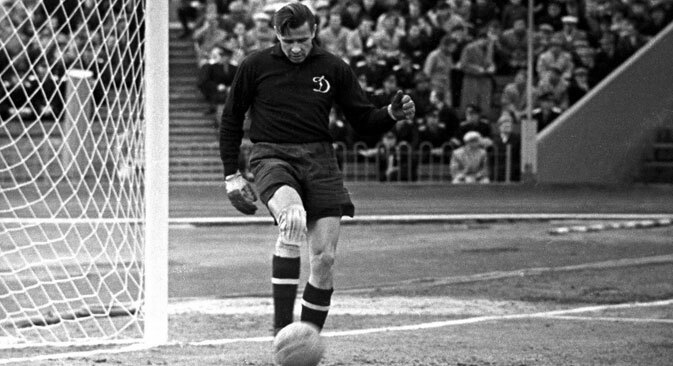 The only goalkeeper in the history of football to win the Golden Ball (the honor given to the best player in the world at the end of the year), Lev Yashin made his debut at the World Cup in 1958 with the USSR national team. The team made it to the quarter-finals, where they lost to the hosts of the tournament, Sweden. Yashin was the only goalkeeper to save a penalty kick at that World Cup. At the 1990 World Cup in Italy, a team representing Africa reached the quarter-finals for the first time. The “Indomitable Lions” of Cameroon were led by the Russian specialist Valery Nepomnyashchy. As the tournament progressed, Nepomnyashchy’s charges defeated the USSR and Argentina (led by Diego Maradona) in the group stage, and a strong Colombian team in the second round, before throwing away a 2-1 lead against England in the last eight. At the 1994 World Cup in the U.S., the Russian soccer team managed an amazing goalscoring feat. For the first time in the history of the World Cup, one player scored five goals during one match. This player was Russian forward Oleg Salenko, who hit the back of Cameroon’s net five times in a 6-1 rout of the African team in the group stage. Sadly it was academic, as Russia had already been eliminated by then after losing their first two games.